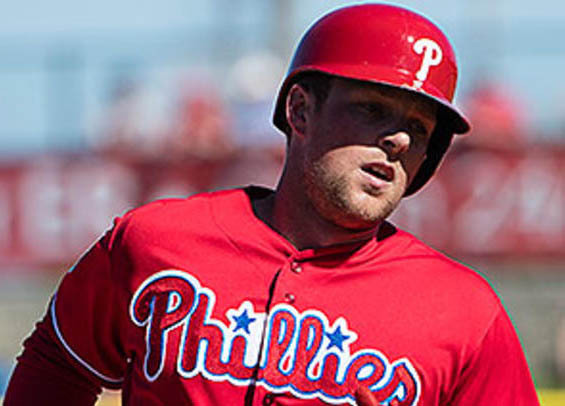 The Philadelphia Phillies are promoting Rhys Hoskins prior to Thursday's series opener at Citizens Bank Park against the New York Mets, according to multiple sources. Hoskins, 24, is the Phillies' No. 6 ranked prospect per MLB.com. Through Wednesday he was hitting .284 with 29 homers and 91 RBI at Lehigh Valley. "I must say that I'm anxious to see him at this level, see how he competes," Phillies manager Pete Mackanin said Wednesday. "I liked his approach in Spring Training. If his at-bats this spring are any indication of what he can do here, he looks like he can handle it here. Matt [Klentak] will make that decision. I'll defer to the people that see him more often than I do." Hoskins is a first baseman, but given Aaron Altherr's absence in left field with a hamstring injury he has an opportunity to slide into a starting spot at the big league level. The experiment in left field is temporary though, at least until the Phillies and general manager Matt Klentak decide on a long term solution at first base, currently manned by Tommy Joseph. The Phillies and Mets open a four-game set tonight. Vince Velasquez is slatted to start the series opener for the Phils.